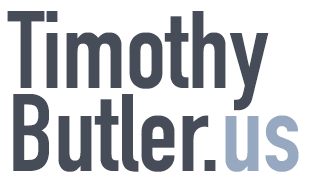 Timothy R. Butler is a pastor, professor and writer. He serves as Pastor of Discipleship at Grace Presbyterian Church. Previously, Tim served as the University Chaplain of Lindenwood University, where he created “the Chaplain's Office,” which reintroduced chapel services and other ministry events at the university. Tim also served as a writer and was editor-in-chief of Open for Business for a decade. He has experience writing on theology, literature, philosophy, technology and politics. Butler earned a B.A. in English Literature and Religious Studies from Lindenwood University and an M.Div at Covenant Theological Seminary. He is currently pursuing a Ph.D. in Reformation Studies at Concordia Seminary (St. Louis). Sermons: Tim's messages from Grace, Lindenwood and elsewhere. OFB: Tim serves as Editor-in-Chief of Open for Business.